This is my very first posting here, and my first refashion project. I am not sure if I do it right, but I am willing to learn. And please excuse my english. Because I felt in love with that refashion idea, I am collecting old garments now, and try to make them fresh and pretty. 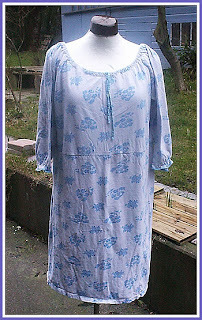 First piece I saw was an old nightgown, my mother gave me years ago for a week I had to spend in hospital. I never wear such ugly gown, and I wanted to put it in the waste bin. But then I read about refashion, and I saved it for later use. It was my first try with refashioning, but I think it should be "make 1 new garments from 2 old", right? This nightgown was worn out, the seams damaged and no shape at all. First I put it into the washing machine with some fabric dye, for that purple touch. Then I bought a bit of blue rubberband and bias satin ribbon. The rubberband now gives the gown a new shape. 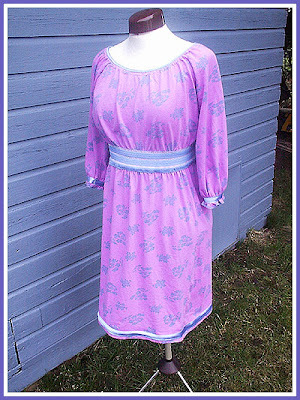 The satin ribbon was sewn on the neckline, and to the edge of the sleeves. And I put some ribbon to the lower seam line for an additional festive touch. I hope I used the correct sewing terms, if not, please correct me. The pictures are bad, sorry for that, I actually have to use a very old digital camera. And here you can see my -tadaaaa!- "new" nightgown. For a few bucks. I am happy and glad that i have overcome the fear in handling a sewing machine. This is my first sewing piece, a 11" by 11" table mat. First Project of 2008: Refashioning! Anyone else guilty of getting bogged down by the holidays and not being able to finish their holiday attire besides me? No worries. Let's put that behind us and start fresh for 2008! This next project starts today, January 15, and ends April 15. Being that it's so close to Earth Day, I thought it would be a great way for us to practice being green by refashioning! This project is all about taking something you no longer need/use/like anymore and turning it into something new and fabulous. There are no rules as to what finished product must be. The only restriction is that you turn something old into something new! Simple, yes?